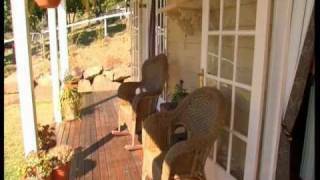 Branell Homestead Bed and Breakfast, located one hour from Brisbane, just outside Laidley in the beautiful Lockyer Valley, is for people who wish to experience the finer things in life, from reading a book in the extensive library, to watching a movie on the big screen. Alternatively, you might enjoy fishing from the private jetty or taking a relaxing stroll around the 80 acre property and discovering the native fauna and flora. Whatever you choose, you will be enchanted with the charm and grandeur of this federation style homestead with its peaceful valley views. Branell Homestead is also a stunning wedding venue that can offer you an affordable, stylish, country wedding with luxurious accommodation. Wedding receptions are held in the large Wedding Pavilion and wedding ceremonies can also be held at Branell. At Branell, it is not compulsory to organise your catering or alcohol through them. Unlike most other wedding venues, they charge a flat venue hire fee. This is where you will save money, because most wedding venues charge per head for food and alcohol. At Branell Homestead, you can have a very personalised wedding at a beautiful location and it does not have to cost you the earth.